The new pinnacle of Mercedes-AMG Driving Performance, the Mercedes-AMG GT R, is set to make its first Australian appearance at the 2017 Liqui-Moly Bathurst 12 Hour Race. To be displayed in the same distinctive “Green Hell Magno” paint colour as the record-setting GT R, the car will be driven around Mount Panorama racing circuit by five time DTM champion, Bathurst 12 hour winner and AMG brand ambassador Bernd Schneider. The AMG GT R shot to prominence late last year after the “Beast of the Green Hell” lapped the Nürburgring Nordschleife in a time of 7:10.9 minutes. 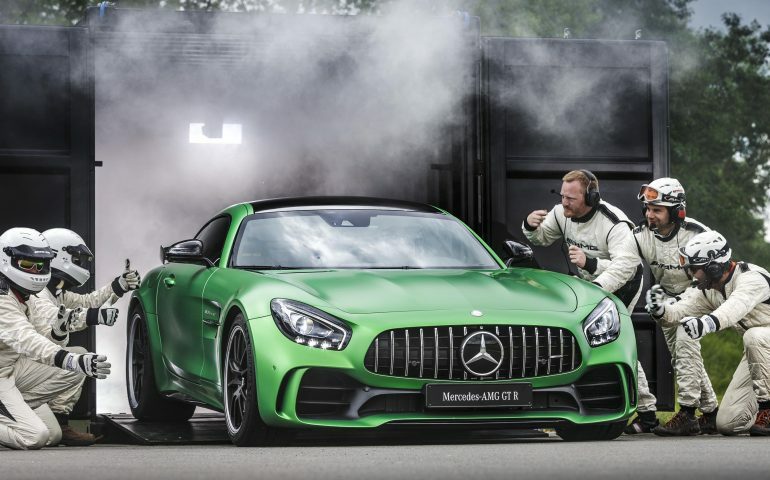 The new spearhead of the AMG model range was faster through the “Green Hell” than any other road-going sports car ever tested by German motoring magazine “sport auto”. The Mercedes-AMG GT R is built on the chassis and drivetrain of the accomplished Mercedes-AMG GT, but cranks up every facet of performance. Wider front and rear wings, automatically adjusting front air intakes, a larger rear aerofoil and a unique rear double diffuser have been added to maximise driving dynamics. Active rear-wheel steering, a nine-stage adjustable traction control system and adjustable coil-over suspension help the driver exploit the optimised twin-turbocharged V8 engine’s 430 kW of power and 700Nm of torque. The Mercedes-AMG GT R will go on sale in Australia in June 2017.